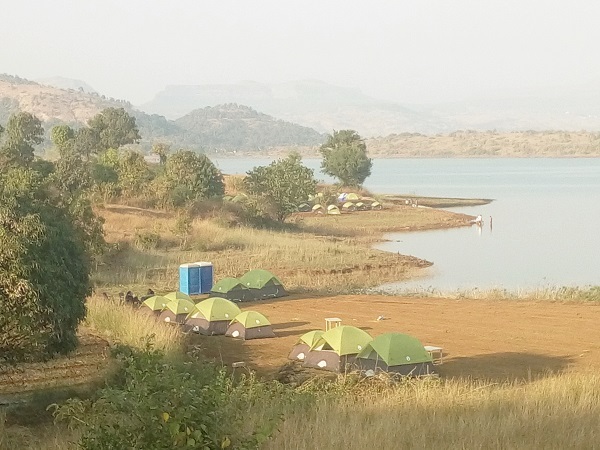 The Camping Village is located at Pawana lake near Ajiwali village. This Camp site is also known as The Jungle camp - Pawana lake or Pawana Camping. The Camping village is Spread over 10 acres of land and advantage of the campsite is , it has full privacy and complete lake touch site. In front you can have a view of pawan lake and Tikona fort. At the left land there is a Tung fort. You can to trek these forts as they are within 5km range. Camping package will start at 4 pm. You will get tea and snacks on arrival. Late night unlimited dinner, Individual group Camp fire, Individual group music, Tent stay with imported sleeping bags, Mineral waters and next day tea breakfast. These things are included in the package. You can take adventure activities with package but you have to travel your own. Total package cost will be Rs. 1800/- per person including adventure activities like Repelling, Zip line, Horse riding and rifle shooting. I am sharing video clip of the campsite. which will give you more idea. You can book online by clicking below link.